Kick off your visit on the 21st (Sat): pause for some serene contemplation at Our Lady Queen of Peace Cathedral, head outdoors with Staircase To The Moon, then pause for some serene contemplation at Catholic Diocese of Broome, and finally stroll the grounds of Japanese Cemetery. Get ready for a full day of sightseeing on the next day: view the masterpieces at Broome Gallery, stop by The Sandalwood Gallery Broome, then identify plant and animal life at Broome Bird Observatory, and finally kick back and relax at Roebuck Bay. To find other places to visit, maps, where to stay, and tourist information, use the Broome trip planner . Toronto, Canada to Broome is an approximately 31-hour flight. You can also do a combination of flight and bus. The time zone difference moving from Eastern Standard Time to Australian Western Standard Time is 13 hours. Traveling from Toronto in September, expect Broome to be a bit warmer, temps between 38°C and 21°C. Wrap up your sightseeing on the 22nd (Sun) early enough to travel to Denham. Denham is the administrative town for the Shire of Shark Bay, Western Australia. 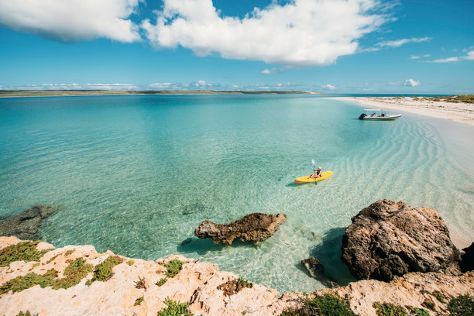 Start off your visit on the 23rd (Mon): tour the pleasant surroundings at Shark Bay and then kick back and relax at Shell Beach. Get ready for a full day of sightseeing on the 24th (Tue): explore the striking landscape of Francois Peron National Park. To see ratings, where to stay, other places to visit, and other tourist information, use the Denham holiday planner . Getting from Broome to Denham by combination of flight and taxi takes about 6.5 hours. Other options: do a combination of flight, bus, and shuttle; or drive. Wrap up your sightseeing on the 24th (Tue) to allow time to drive to Kalbarri. Start off your visit on the 25th (Wed): admire nature's wide array of creatures at Rainbow Jungle, identify plant and animal life at Kalbarri Pelican Feeding, and then get a new perspective on things with Boat Tours & Water Sports. Get ready for a full day of sightseeing on the next day: get great views at Red Bluff, then explore the activities along Murchison River, and then explore the striking landscape at Nature’s Window. To see traveler tips, maps, and other tourist information, read our Kalbarri trip planning website . Traveling by car from Denham to Kalbarri takes 5 hours. Alternatively, you can do a combination of shuttle, bus, and taxi. Wrap up your sightseeing on the 26th (Thu) to allow time to travel to Esperance. Esperance is a town in the Goldfields-Esperance region of Western Australia, on the Southern Ocean coastline approximately 720km east-southeast of the state capital, Perth. Kick off your visit on the 27th (Fri): steep yourself in history at Esperance Stonehenge, then enjoy the sand and surf at Lucky Bay, and then enjoy the sand and surf at Twilight Bay. To find traveler tips, more things to do, where to stay, and more tourist information, refer to the Esperance online vacation planner . You can do a combination of taxi, bus, and flight from Kalbarri to Esperance in 9 hours. Alternatively, you can do a combination of taxi, bus, flight, and car; or drive. In September, plan for daily highs up to 22°C, and evening lows to 9°C. Finish up your sightseeing early on the 27th (Fri) so you can go by car to Albany. Kick off your visit on the 28th (Sat): steep yourself in history at Princess Royal Fortress, then kick back and relax at Middleton Beach, and then kick back and relax at Little Beach. Here are some ideas for day two: see majestic marine mammals with a dolphin and whale watching tour. Before you visit Albany, use our trip planner to discover what you can do and see there. Traveling by car from Esperance to Albany takes 5 hours. Alternatively, you can fly; or take a bus. In September, plan for daily highs up to 21°C, and evening lows to 9°C. Cap off your sightseeing on the 29th (Sun) early enough to go by car to Margaret River. You'll explore the less-touristy side of things at Margaret River Venison Farm and Wonky Windmill Farm & Eco Park. Take a break from the city and head to Sunflowers Animal Farm and Canal Rocks. Change things up with these side-trips from Margaret River: Yallingup Beach (in Yallingup) and Dunsborough (Meelup Beach & Dolphin & Whale Watching). There's still lots to do: do a tasting at Howard Park - Margaret River Winery and Cellar Door and cruise along Caves Road. Before you visit Margaret River, use our trip planner to discover what you can do and see there. Traveling by car from Albany to Margaret River takes 4.5 hours. Alternatively, you can take a bus; or do a combination of flight and bus. Wrap up your sightseeing on the 2nd (Wed) early enough to travel back home.